NetLine Portal is a self-service solution for B2B content syndication and lead generation. The solution enables marketers to syndicate content across its B2B lead generation network and reach decision-makers actively researching business-related topics, according to the company. NetLine uses lead criteria, target audience and content relevance to help connect content with the right professionals. Marketers can create campaigns by uploading content, setting company and job lead criteria—including job area, job level, industry, company size, and geography—and campaign budget. 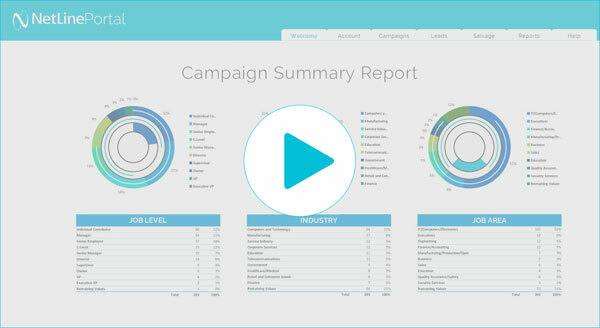 The campaign dashboard enables marketers to manage multiple campaigns with ease and receive real-time lead insights reports. Watch a video about the features here. The NetLine Portal is built for small-to-medium sized businesses and agencies that want the power to create, manage and optimize their own campaigns. Enterprise-level services solutions are also available. NetLine supports connectors into every major CRM, ESP and MAP, including but not limited to: Marketo, HubSpot, Eloqua and Salesforce. Marketers can set up their connector and map leads in three steps directly in the NetLine Portal. A $5,000 budget minimum must be met before real-time connectors can be enabled. Self-service lead generation campaigns start at $9 per lead, with a minimum campaign spend of $500. Marketers are able to set their lead volume and budget before launching a campaign. Contact NetLine for full-service pricing options. Current clients include Adobe, Appian, Citrix, Oracle, ReachMail Media Services, Sage and Salesforce. B2B marketers gain access to a B2B-specific content syndication and lead generation network with advanced lead form technologies optimized to drive lead form conversion, according to NetLine. NetLine Portal is performance-based, and users only pay for leads that match their set lead criteria with a cost-per-lead pricing model.